We welcome you to Purple Destinations. We have a vision to offer exceptional travel experience to our fellow customers. Purple is committed to unfold newer and unique destinations for our travellers and to explore world's greatest cultures, exquisite cuisine and at the same time relax and enjoy the holiday. We are specialized in Corporate Tour operations for more than 2 decades, we have our own fleet of high tech coaches and vans which enables us to provide with the best tour logistics required to make a perfect tour. All this is delivered through our immense network in India and associate offices in Thailand and Singapore. We cater according to the specialized corporate requirements and we tailor-make our packages with wide-ranging inclusions like Corporate Branding accessories and theme inclusion just to name few and persistently upgrading our tours. Our professional and knowledgeable guides, best hotel locations and authentic Indian food are our strengths. 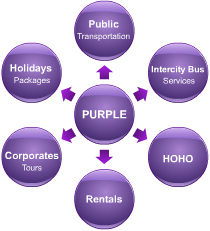 With Purple Destinations, you are sure to have an enjoyable, stress free and secure tour. Our knowledgeable and professional tour escorts are equipped to handle any situation skillfully and make sure that your tour becomes indeed an everlasting holiday.